If you have been feeling the winter cold this winter inside as well as out you might be thinking about ways to keep the expense of heating your home under control. Well-placed plantings can significantly alter the microclimate around a home, resulting in a more comfortable environment and significant savings in heating and cooling costs over time. A drawing of a windbreak. Winter winds increase the rate of air exchange between the interior and exterior of a house, lowering the interior temperature and thereby increasing the heating demand. In a windy site, a windbreak planting (also called a shelterbelt) can account for up to a 50-percent wind reduction and up to a 25-percent reduction in heating fuel consumption. A windbreak is a single or multiple rows of trees or shrubs in a linear configuration. The goal of a windbreak is to reduce wind speed. Living windbreaks will reduce wind speeds for a distance 30 times the height of the windbreak. However, the maximum zone of wind reductions occurs at 5 to 7 times the height of the windbreak. A wind barrier that permits 50 to 60 percent wind penetration (as in the case of evergreen trees) is more effective than a solid barrier (such as a fence) because it provides a larger area of protection on the leeward side. Evergreen trees (conifers or broadleaf evergreens) are very effective in reducing wind speed. 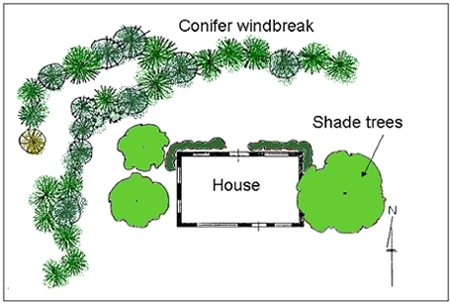 Shrubs next to a house can also reduce wind speed. Dense evergreen shrubs planted about 5 feet from a house will create an area of dead-air space. This dead-air space decreases heat loss from the house walls. For maximum effectiveness, windbreaks should be oriented perpendicular to the direction of prevailing winter winds. In Virginia this is usually the northwest side of the area to be protected. The windbreak should be longer than the area to be protected. Wherever space permits, an extension on the east side will help, too. Generally, savings from windbreaks increase as the protected perimeter of a house increases; however, even a few well-placed trees make a difference. Choose a relatively fast-growing, dense conifer or broadleaf evergreen species with stiff branches that will mature at a height about 1.5 times the height of the house. The species should retain branches low to the ground at maturity. Most pines lose their lower branches with age, thus, they will serve as an effective windbreak for about 20 years. For a long-term windbreak, select species that keep their lower branches such as spruces, firs, arborvitae, and eastern red cedar. In the event your windbreak trees lose their lower branches, you can plant a row of dense evergreen shrubs at the base of the trees. Norway, white, and Colorado blue spruce are among the best windbreak trees; blue spruce usually provides the most protection, but is slower-growing than the others. Consult your local Extension agent or garden center personnel to determine which conifers and broadleaf evergreens are suited to your area. In regard to the number of rows of trees, the effectiveness of a windbreak generally increases with each added row, up to five rows. With dense trees such as spruce, two rows are usually the most cost-effective. The distance between rows depends on the mature height of the tree species. More northerly tree rows will cast shade onto trees of adjacent row(s) to the south. Since most conifers only tolerate a small amount of shade, your rows should be far enough apart to avoid the shading phenomenon. In regards to the spacing between trees, it will, in part, depend on the mature width of the tree species. Trees can be planted at a distance less than their mature width to decrease the time to form a solid barrier. Spacing also depends on how quickly you desire the plants to grow together. Deciding how close to place plants is a compromise between planting plants at a close spacing (having plants grow together quickly) versus the cost of buying more plants which will be required for close spacing. Conversely, a wider spacing will take longer to fill in, but you will be buying fewer plants and spending less money. Soil preparation prior to planting should include testing the soil and applying nutrients and lime as recommended. Tilling will be necessary for compacted soils. Early spring is a good time to plant windbreak trees, as it allows plants to grow roots into the surrounding soil before the first winter. For more information about this and other landscape topics contact your local Virginia Cooperative Extension office. The local Virginia Cooperative Extension office numbers are Albemarle 872-4580, Fluvanna 591-1950, Greene 985-5236, Louisa 540-967-3422, and Nelson 263-4035.